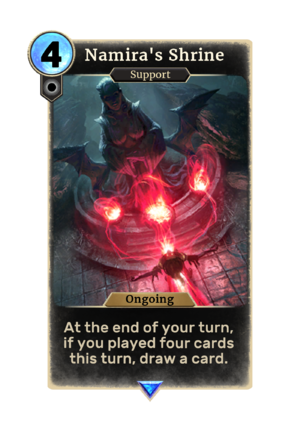 Namira's Shrine is a rare Neutral support card. It is part of the Forgotten Hero Collection. It is available as part of the Forgotten Hero Collection. "Praise to Namira, whose fear is the ancient darkness." The card is named for the Daedric Prince Namira. This page was last modified on 27 February 2019, at 23:54.